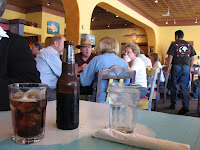 Last week, while I was wandering around New Mexico (okay, really, I WAS working, but wandering sounds so...nomadic) my friends and I had time to stop for lunch before heading to the airport. It had been a particularly hard travel week for all of us and the last meeting of the day didn't go so well. 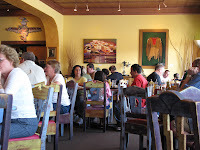 All of us were out for a satisfying lunch, come hell or high water. It was crowded, as you can see. Of course, this was the Friday of the Balloon Fest so likely there were some tourists in town. Or, it could have been because the food is that good. Now, my friend, D, is a carnivore like me. J, is vegetarian. 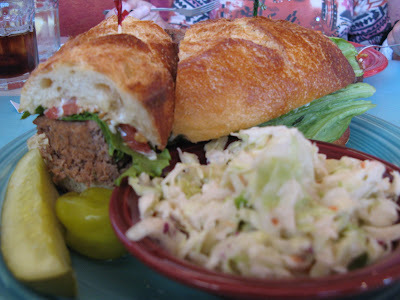 Still, we were able to find lunches that met all of our food requirements and provided the momentary comfort we sought. D is a big fan of meatloaf. We tease her about it a lot. She doesn't eat anything she considers to be exotic and meatloaf is safe. If it's on the menu, we know what she's going to order. Me? I just love meatloaf, non-exotic, or no. I love it. And that day, I needed meatloaf. Wow. Get a load of that platter. Comfort food abounds. All the while J, is drooling over her vegetarian Reuben. Boy, does that sound like a contradiction. How can you have a Reuben without corned beef? Well, here it is. 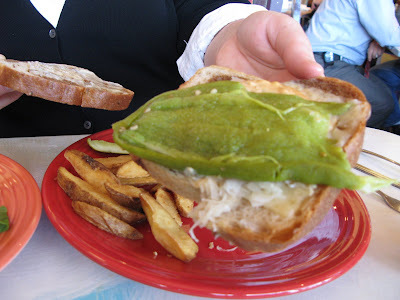 With a nice big, fat green chili. Only in New Mexico. 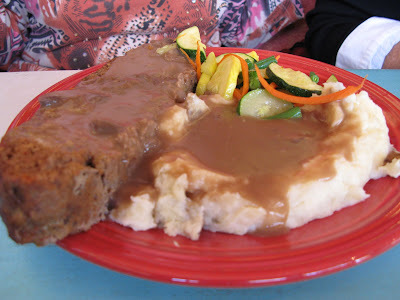 Will I slip back through Bernalillo again for the meatloaf? Definitely. Some days you just need meatloaf. 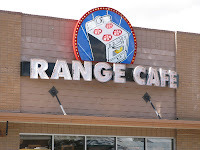 Maddie, thanks to your pictures taken at the Range Cafe, for supper tonight I fixed a huge meatloaf (with coarsely chopped onions--YUM!) and mashed potatoes. No gravy. I don't do gravy anymore. But plenty of butter! Butter is, of course, a health food, being in the Dairy Group. Right? Dessert was chocolate brownie cupcakes with--you guessed it--chocolate icing. Leftover birthday delicacies. Magdalena! So you are a meatloaf girl, too? And yes, big choppy onions. And of course, chocolate is a food group. And dairy. As Paula Deen about the butter, now. Essential.